Sleep is one of the most important things for your health. To make your body and brain rest nicely, you need to eat healthy food before going to bed. So, what is that food? Are Kiwis Good for Sleep? Is Chocolate Good for Sleep? Is Almond Milk Good for Sleep? What Herbal Teas are Good for Sleep? It is known that bananas are rich in vitamins and minerals. They contain many beneficial substances, and their composition is unique. The most valuable vitamin for sleep is A, which helps normalize the process of dreaming. Moreover, a large amount of magnesium can help your body relax well during the night. There is also a lot of phosphorus in banana content, which takes part in the recovery of nervous system during a sleep. Bananas are an excellent choice for dinner. In addition to the beneficial properties of bananas we have mentioned, this fruit is a source of serotonin and melatonin, hormones of joy and sleep. This means bananas can help both sleep and wake up calmly. Be careful with this food, as bananas are very calorized. Eat one 2-3 hours before going to sleep, so that all those calories are burnt. It is also a good idea to add bananas to some fruit salads. Kiwis are good for sleep for the same reason as bananas are. They contain many vitamins and minerals, vitamin A and magnesium included. As we have learnt, these two substances can improve sleep very well. However, they are not the only benefit of kiwi. There is a huge amount of serotonin in one medium kiwi, even more than in a banana. Therefore, it is good to eat them anytime, especially before going to bed. Kiwis contain a lot of different antioxidants, which are also very important for your body during night sleep. These substances prevent the formation of free radicals and eliminate already existing. This way they help your tissues receive all the vitamins and minerals fully. The deficit of folic acid is often a reason to insomnia. And kiwi is one of the best natural sources of it. Considering mentioned it is a good idea to make a fruit salad with bananas and kiwis. Eat this meal a couple of hours before going to bed, and you will sleep like a child. Lettuce is a curative product for dietary nutrition. Vitamins contained in leaves of this plant are especially valuable for the body during spring and autumn beriberi. Regular consumption of lettuce can improve appetite and has a beneficial effect on digestive system. It has many health benefits for nervous system, therefore helps in fighting insomnia. There are many vitamins in lettuce, as well as microelements. The most significant difference in comparison to bananas or kiwis is iron. Lettuce contains a lot, and it is also beneficial for a good sleep. The best way to consume lettuce before sleep is eat it as is. However, you should also use it externally. For example, add some boiled leaves to a warm bath. This way your skin will calm down too, and no itching will be disturbing you at night. Add lettuce to some of your favorite meals. It is a nice spice that will not spoil the taste of a steak or a soup. However, the more benefits you get out of it, the better it will affect insomnia. Chocolate (or better to say cacao beans) is also a nice source of vitamins and useful antioxidants. Therefore, it is rather beneficial for sleep improvement. However, not any chocolate is good enough. It is known that the darker a chocolate is the more benefits it can grant. That is because if there is a small percentage of cacao in a bar, it contains a lot of milk, sugar and other additives. It is not bad, but you need cacao as is. Milk chocolate is not good enough, because it is too calorized for eating before bed. This means your body will spend time on digesting it, and there will be no benefits for sleep at all. So, eat a few bites of the darkest chocolate you can withstand. All the vitamins, as well as serotonin, will help you relax and rest nicely. Remember that white chocolate contains almost no cacao. Therefore, it cannot be any good for your sleep. If you like it, you should not eat it 4-5 hours before bed, because white chocolate is a huge sugar bomb, and sugar will only energize you. Cheery is known to contain a large amount of vitamins. However, it is hard to get it at winter (only if you have frozen some before). Therefore, a nice alternative is a cherry juice, which you can buy at any season in your local store. The substances contained in cherry juice saturate your cells and tissues. They help maintain a strong immunity and fight various problems, insomnia included. The thing is cherries have a unique composition of beneficial vitamins and elements, which together stimulate the production of melatonin – sleep hormone. All you need is to drink a couple of cherry juice glasses a day. However, do not do it straight before going to bed, as it is a powerful diuretic. Cherry juice, unlike bananas and kiwis, does not affect your sleep immediately. It provides hormone stimulation, meaning it takes some time to start helping. Milk is known to be an extremely beneficial beverage. There is no need to name all the advantages of drinking it, as you probably know them yourself. However, is it actually good for sleep? Milk is the best natural product for fighting insomnia. It contains a unique substance – tryptophan. This substance is an amino acid, which provides serotonin stimulation. With the lack of it, you feel depressed and it is hard for you to sleep well. To make milk the most beneficial for sleep, you need to warm it a bit and drink a half of an hour before going to bed. It is also a good idea to add a teaspoon of honey. Honey is also good for sleep, especially in composition with milk. It contains a lot of sugars, but not sucrose, only fructose. It takes a while for your body to absorb it into blood, meaning fructose is not an energizer. Moreover, it is slowly turned into small portions of energy during your sleep, so your brain gets just enough to calm down and relax. Add useful properties of milk, and you get a nice remedy against insomnia! Almond milk is a nice alternative of a regular one. It is useful for those who is on a diet. Moreover, you can drink it even if you have lactase intolerance, as there is no such substance in the composition of almond milk. Nevertheless, almonds do contain most of the same vitamins and minerals that milk does. It is even more useful by some means. Therefore, you can drink it instead, if you like it more. Almond milk can help you sleep well, as it contains a huge amount of iron, as well as vitamin A. Both these substances stimulate the production of serotonin and melatonin; therefore, they fight insomnia very well. The best way to save most herb’s benefits is to make a decoction. That is why there are many teas with herbs included. You can find a tea for any kind of illness, insomnia included. Of course, there is no harm in drinking some mixes, but the most beneficial for sleep are banana and chamomile teas. We have discovered why bananas are good for sleep. So, what is the difference in a tea? Well, first of all, it is made not only with flesh, but also with peel. The last one contains much more vitamins and minerals. We do not eat it, because it is not useful as is. However, if you dry it and then steam out, you will receive almost all the benefits without a need to eat a peel. Of course, you can also make a decoction with a fresh banana flesh, but it will not be as beneficial as an actual tea. The last one is a concentrate of minerals, iron, magnesium and phosphorus included. All three take part in helping your body and brain relax. Moreover, banana peel (and the tea as well) contains more vitamin A, than a flesh. Chamomile tea restores your nervous system, it soothes, helps to relax, relieves depressive conditions and the effects of stress. It is also a nice remedy against insomnia. Those who regularly drink chamomile tea are less prone to neuroses, irritability and sleep disturbance. As for banana peel, you cannot simply eat a chamomile, but you can get all the vitamins out of it by steaming the flower. And there are actually lots of useful substances in chamomiles. It is very important to sleep well. A good sleep does not only affect your mood, but helps your body relax and, by that, restore after a hard, stressful day. 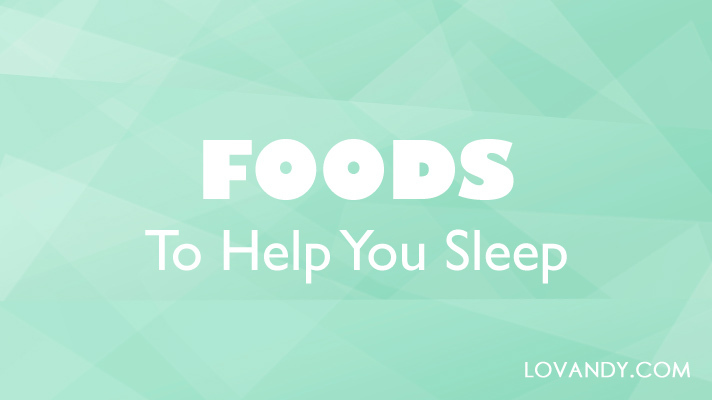 There are various different foods that can help you overcome insomnia. So, choose the one you like, and tell us about the effect it did!